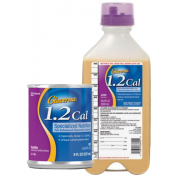 GLUCERNA 1.0 CAL is a specialized diatary aid with carbsteady. This is designed for individuals with type 1 and type 2 diabetes or pre-diabetic patients who show signs of insulin resistance. Patients with hyperglycemia and metabolic stress from trauma, infection or illness can also benefit from this nutritional formula. 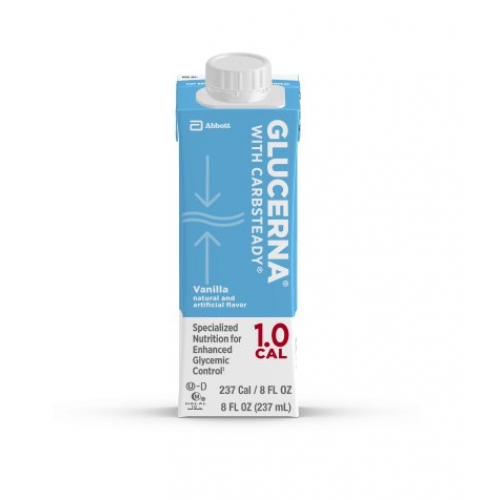 With less than half of its calories derived from carbohydrates as well as a unique blend of fat and fiber, Glucerna 1.0 Cal has clinically been shown to minimize glycemic response. Abbott Nutrition developed the formula to include modified, monounsaturated fats to follow the recommendation of the American Diabetes Association and American Heart Association as well as 24 key vitamins and minerals and soy fiber for digestive health to maintain healthy bowel function. It can be consumed for oral and tube feeding. It has a mild vanilla flavor in 8 ounce tetra cartons or unflavored 1000 or 1500 mL ready-to-hang bottles. Always use clean feeding sets. Cleaning sets cannot be shared with other patients. For oral or tube feeding and not IV use. Do not feed to patient with galactosemia. 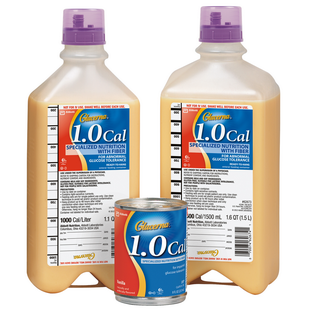 Liquid Unflavored: Water, Corn Maltodextrin, High Oleic Safflower Oil, Sodium & Calcium Caseinates, Soy Fiber, Fructose, Canola Oil, Soy Lecithin, Magnesium Chloride, Calcium Phosphate, Sodium Citrate, Natural & Artificial Flavor, Potassium Citrate, m-Inositol, Ascorbic Acid, Potassium Phosphate, Potassium Chloride, Choline Chloride, Carrageenan, L-Carnitine, Taurine, Zinc Sulfate, dl-Alpha-Tocopheryl Acetate, Ferrous Sulfate, Niacinamide, Calcium Pantothenate, Manganese Sulfate, Cupric Sulfate, Thiamine Chloride Hydrochloride, Pyridoxine Hydrochloride, Riboflavin, Vitamin A Palmitate, Beta-Carotene, Folic Acid, Biotin, Chromium Chloride, Sodium Molybdate, Potassium Iodide, Sodium Selenate, Phylloquinone, Cyanocobalamin, and Vitamin D3. Allergens: Contains milk and soy ingredients. 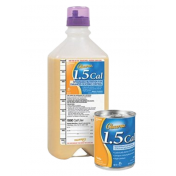 Liquid Vanilla: Water, Corn Maltodextrin, High Oleic Safflower Oil, Sodium & Calcium Caseinates, Soy Fiber, Fructose, Canola Oil, Soy Lecithin, Magnesium Chloride, Calcium Phosphate, Sodium Citrate, Natural & Artificial Flavor, Potassium Citrate, m-Inositol, Potassium Phosphate, Potassium Chloride, Choline Chloride, Ascorbic Acid, L-Carnitine, Taurine, Zinc Sulfate, dl-Alpha-Tocopheryl Acetate, Ferrous Sulfate, Niacinamide, Calcium Pantothenate, Manganese Sulfate, Cupric Sulfate, Thiamine Chloride Hydrochloride, Pyridoxine Hydrochloride, Riboflavin, Vitamin A Palmitate, Beta-Carotene, Folic Acid, Biotin, Chromium Chloride, Sodium Molybdate, Potassium Iodide, Sodium Selenate, Phylloquinone, Cyanocobalamin, and Vitamin D3. Contains milk and soy ingredients. Does Glucerna come in feed bags for an IV? 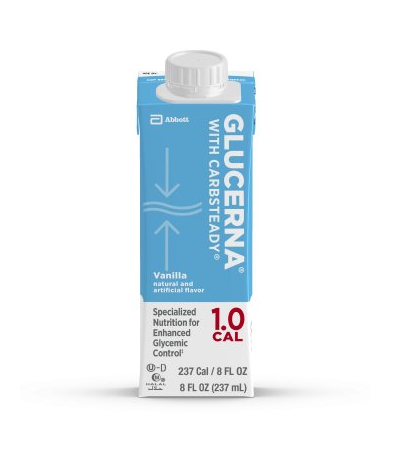 Glucerna does not make feed bags for IV usage.